Since the Webpal didn't have a real time clock, I decided to add one. I chose a DS1302 RTC chip and wired it up using some of the IO pins of the CPU that originally were used by the Chrontel CH7001A chip for centering information. Since I wasn't using TV output (and there isn't any support in the Linux port for this anyway! ), these pins were available for other hacking purposes. 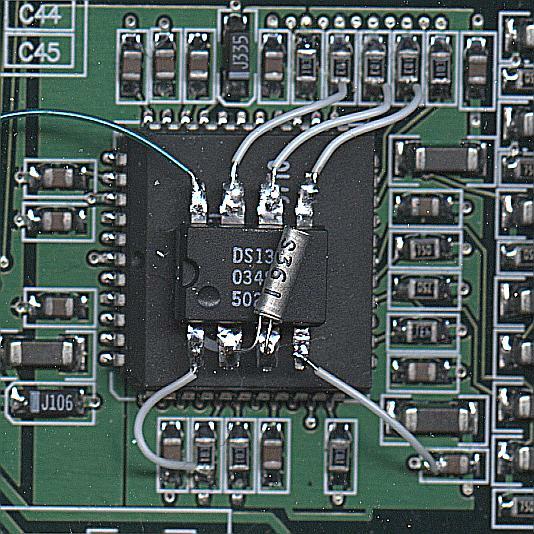 I set up the bootstrap loader to power down the Chrontel CH7001A chip (tvoff=1) and wired up the DS1302 on top of the Chrontel CH7001A chip as shown in the photo to the right. A 3V lithium battery is needed to supply backup power when the Webpal is powered down. You can see the wire leaving the photo on the left side going to the positive terminal of the lithium battery. The negative terminal of the lithium battery is connected to ground. A supercap could be used instead of the lithium battery, but that would require modification of the RTC driver to enable the trickle charger in the DS1302. Obviously, the trickle charger shouldn't be enabled if you hook up a non-rechargable (and possibly explodable when recharged) battery like a lithium cell! I ordered the DS1302 and the 32.768 crystal from Digikey. Be sure the crystal you order is one designed for 6pf loading, otherwise your RTC will not be accurate. A datasheet for the DS1302 can be found here. PIN 1 (VCC2) connects to R8 on the side farthest from the Chrontel CH7001A. This is +5V. PIN 4 (GND) connects to C41 on the side closest to the Chrontel CH7001A. This is a GND. Included in the kernel diffs is a driver for this chip as wired above. It is enabled in the kernel configuration program using the Webpal Real Time Clock Support option in the Character devices section. It is accessed from Linux via /dev/rtc. Also, the driver exports status information via /proc/driver/rtc. The driver is based on the rtc driver for x86. To access it from the command line, I use hwclock which exists in newer versions of busybox.